THOUGHTSKOTO Thoughtskoto : Do you Know That Demafelis Employer Was Only Sentenced In Kuwait But They Are Still In Lebanon and Syria? Do you Know That Demafelis Employer Was Only Sentenced In Kuwait But They Are Still In Lebanon and Syria? Just a few months ago, the body of Joanna Demafelis was found inside a freezer in an abandoned flat formerly occupied by her Lebanese and Syrian employers in Hawally, Kuwait. President Duterte declared total deployment ban for all overseas Filipino workers (OFW) in Kuwait. The ban could be lifted should the demands of the Philippine government would be met— one of which is bringing justice to Demafelis' death. The murder suspects were already arrested, Nader Essam Assaf, the husband, in Lebanon and Mouna Hassoun, the wife, is being detained in Damascus, Syria. 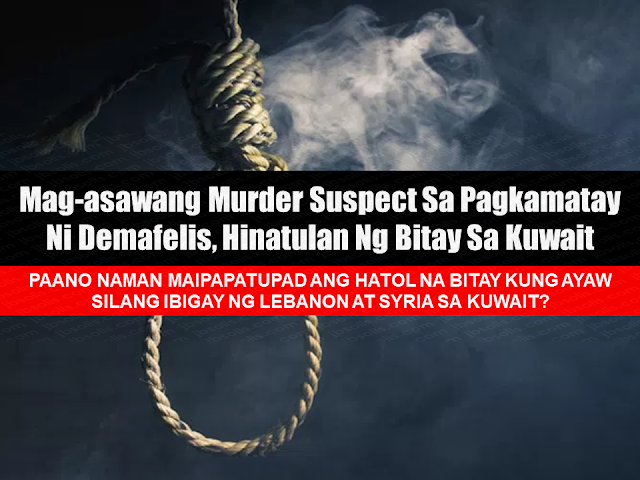 The Kuwaiti government has already sentenced the couple of death penalty for the murder of the OFW. However, it is not yet clear if the couple will undergo trial in Kuwait or the Lebanese and Syrian government would comply for their extradition to Kuwait where the crime was committed. 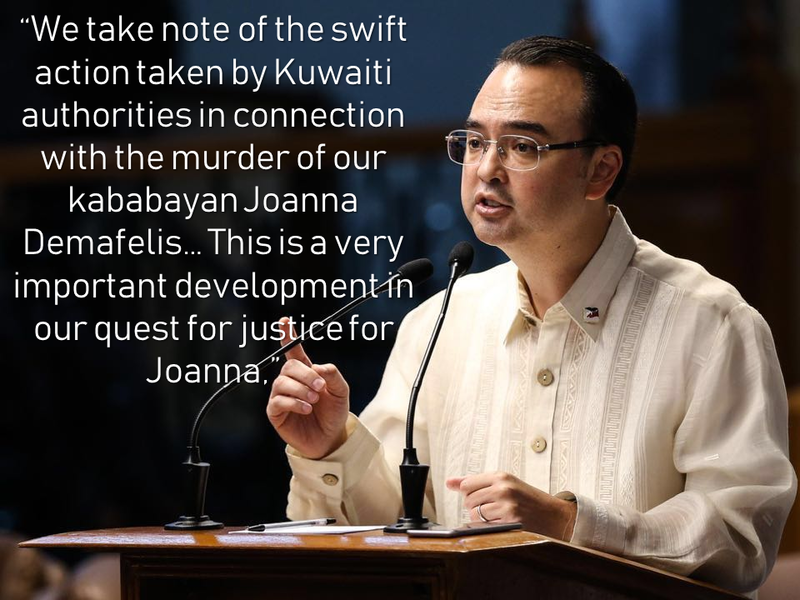 The Philippine government has welcomed the decision of a Kuwaiti court to sentence to death the former employers for the murder of Joanna Demafelis. The Department of Foreign Affairs said in a statement it was looking forward to the cooperation of the Kuwaiti, Lebanese and Syrian governments "to bring this case to a close." Cayetano said Kuwaiti authorities informed Foreign Affairs Undersecretary for Migrant Workers Affairs Sarah Lou Arriola of the court decision at a meeting in Kuwait on Sunday. The embassy later obtained a copy of the court decision. Media reports pertaining to court authorities in Kuwait later said the Lebanese principal suspect and his Syrian wife were tried in absentia also on Sunday and sentenced to death for killing the 29-year-old OFW hiding her body in a freezer and left Kuwait. They were both arrested in Lebanon and Syria respectively. According to Ambassador to Kuwait, Renato Villa, Kuwaiti authorities have requested the extradition of Assaf. The DFA said Lebanese authorities may decide to conduct trial on him in Beirut instead. If that will be the case, Undersecretary Sarah Lou Arriola said the DFA would provide lawyers to assist. Philippine Embassy in Beirut was scheduled to meet with Lebanese authorities handling the case to see how they would want to proceed with the trial.